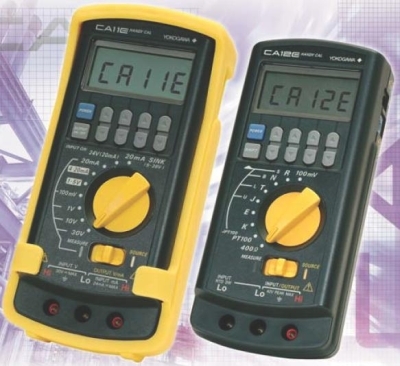 The CA11E is a Voltage/Current Calibrator including both signal source and measurement functions. The unit has simple operation and is easy to use, with a lightweight, compact body. 4-20 mA and 1-5 VDC Step-up/down Function: The output level can be changed between 1<>2<>3<>4<>5V signals for the 1 to 5V DC output, for efficient calibration work. 20 mA SINK Function: Absorb the voltage supplied from an external power supply to its H terminal and simulates a two-wire transmitter, idea for loop checks. Sweep Function: Increase and decrease the output level to the preset level at a constant rate for the selected sweep time (16 or 32 seconds). The sweep function and sweep time are set by the internal dip switch.